I am reading another website one day where a Mac user is asking which speakers he should purchase for under one hundred dollars. Most answer with the typical crappy-speakers responses, but I see one for a new computer speaker from Rogersound Labs. I stay pretty up to date on computer speakers, as I tend to review a lot of them. But I had never heard of Rogersound Labs. So curiosity got the best of me, and I made a call to Rogersound Labs myself. First of all, the Rogersound Labs is not a large company. Actually, you could honestly say they are a very small company. I like them already. Furthermore, the history of their company makes for interesting reading on their website, and I am a sucker for a good story. But the best company story in the world does not mean they can produce a speaker worth listening to, so I requested a pair for evaluation, and have spent the last six weeks putting the RSL Digital Fidelity One (DF1 from here on out) speaker system through the rigors on testing. A week after receiving them, I saw another Mac site post a review, comparing them to another set of speakers. I know for a fact that the reviewer had not had these speakers in his possession for more than a week, and in fact I received my review pair before he did. So how the heck can he have a review posted already? One of the things that you have to do to judge and review a pair of speakers is to give it a break-in period. So how can the other site give a fair review in less than a weeks time? For one, they resorted to a convoluted testing system in which they relied more on sound graphs than anything else. We are talking about a pair of speakers here, not an oscilloscope. However, the review really was pretty poor in telling the reader much more than technical information, so I was not too disappointed in seeing such an early review. I won’t, and don’t, use graphs here for speaker reviews. First, they really don’t tell you anything if you don’t have the correct set-up to accurately measure the sound coming from the speakers. (Which the above review did not.) Second, placement is important. 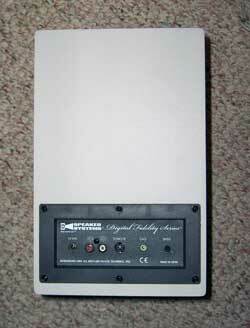 How the speakers are placed can adversely affect the quality of sound. Not with all speakers, but many. And most importantly, how do they sound after listening to them, with a wide variety of music, over an extended period of time? These are all factors I use when reviewing speakers. Sound is very subjective. What sounds good to me may not sound good to you. I do consider myself an audiophile, however, and have been one for longer than I have been a Macintosh user, so there is something to be said for someone such as myself who has heard some of the very best speakers money can buy, as well as some of the worst. But I digress. First impressions of the DF1?They are not very pretty. In a day and age of style, the DF1’s look very early 1990’s. But these are speakers, and esthetics can only play a small roll here. Besides, if looks we everything, there is no way my wife would have ever married me! Putting aside the dated beige look, the DF1’s are really well constructed. They don’t feel cheap. 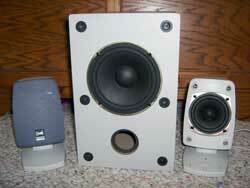 They feel like solid workmanship was behind the manufacturing of these speakers. 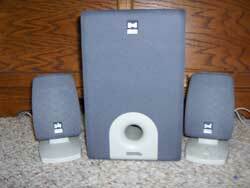 The soft grey cloth speaker grills, for instance, is especially nice. And the plastic itself feels durable, solid, unlike some other speakers in the same price range on the market today. In fact, on a recent visit to Best Buy, I checked out some of the low-price computer speakers they had. To a one, they all “felt” cheap, with crack-easy black plastic casings that were too shinny and cheap looking. The DF1’s come with two satellite speakers and a sub. The base of the satellites can actually be removed, so that you can place the controls on either side of your desk. A nice feature. They are set up for right and left, so you cannot simply move one speaker to the other side of your desk, but with the stands being removable, you can have the controls where you prefer. I keep mine on the right speaker. The speaker controls are limited. 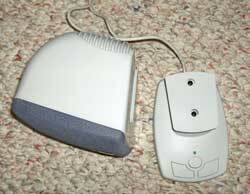 It sports and on/off button, and an up / down volume control. Standard, but there is a major flaw here. There is no volume indicator on the speaker control, just one button pointing up and one pointing down. I prefer being able to quickly glance at the speaker controls to see where the volume level is set. However, when you first turn them on, the volume setting defaults to a mid-range volume, so that you won’t accidentally blow your eardrums if you were listening to them too loudly the night before. Still, I would prefer to have some sort of volume indicator. Ah, the most important aspect of ANY speaker review: sound quality. After I first received them, I again talked to the owner of Rogersound Labs. My concern was that, while not directly comparing them to a three hundred dollar speaker system I use for daily enjoyment, I did notice that the mid-range sound did not seem as full as I was used to. This was more from the fact that many speaker manufacturers tend to use “studio monitor-like” speaker tweaks to get that sound. However, the more I listened to them, the more I appreciated the less-harsh sound they made compared to many other computer speakers with a more “bright” mid-range. Still, and I did miss it some, especially when listening to harder Rock music. Classical, Country, and the like sounded just fine. And the missing mid was much more pronounced at lower volume. The bass sounds good, but it is not thumping by any means. In fact, I would have liked the bass to be more pronounced. Moving the subwoofer closer to the wall helped some, but it did not compare favorably to my $300 speakers. A fair comparison? Not really, no. For the average computer user wanting to buy new computer speakers, the bass would probably sound just fine. Most of my lab-type of review is done with pre-recorded music. But I found another method to test speakers recently, and that is using a keyboard and GarageBand. With the plethora of musical sounds GarageBand is capable of playing and reproducing, this has become an indispensable tool. And it was here with GarageBand that I truly became impressed with the DF1’s. The DF1’s have a very natural, balanced sound. The acoustics of your room notwithstanding, I found that these speakers really did something important that many people will overlook. They got out of my way when playing music. In other words, I could not tell either where the sound was coming from, or that it was being played on a computer. The soundstage with the DF1’s is really nice, though they do depend more so on proper speaker placement than other, more expensive speakers do. The sound quality while playing music in GarageBand sounded very natural, as if an actual musician was playing music in the room with me. Guitar, especially acoustic, was especially nice with the DF1’s. As was Church Bells, Grand Piano, Horns, and other “real” musical instrumental sounds. The heavy bass music and loops, such as Party Hip-Hop, did not fair quite as well, mostly because of the smallish subwoofer. I enjoyed my time with Rogersound Labs three-piece Digital Fidelity One Speaker System. While not as “bright” as more expensive speakers, at the price-point these sell at, they stomp all over similarly priced speakers. No question. They simply do not sound like sub-sixty dollar speakers. They sound much more rich, much more balanced in the sound quality. For a true audiophile, these are probably not for you. For the average music listener, especially those who don’t usually play their music really loud, you will be pleasantly surprised with the SD1’s. You can also remove the satellites from the stands which will reduce the height to 4 ?”. So impressed with the sound quality compared to the price point, I have to give these speakers a somewhat higher rating than I would if these were priced over $100 US. That being said, the natural sound quality of the DF1’s are very good, and I could easily see myself using these in a smaller room as a secondary sound system, such as a bedroom. I would also enjoy using them for GarageBand usage. Pros: Good, balanced sound. Price. Quality workmanship. Cons: Less bright mid-range, weak bass.